I rented a car and drove us out to the most important historic site in Iceland. 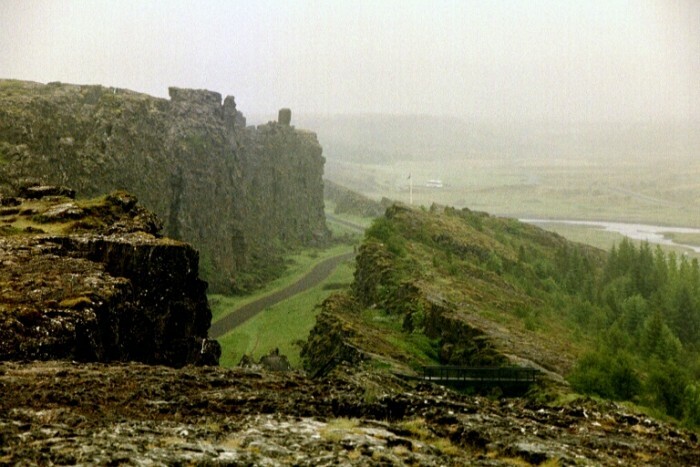 The AlÞingi or Althing, the Icelandic parliament begun in 930, met at this stunning natural amphitheatre, formed at the meeting point of the North American and European/Asian tectonic plates. The Summer AlÞingi was a two week gathering at the time of the Solstice. At it all law cases were heard and decided upon by a Law Speaker, a man charged to learn and recite all the laws. He recited one third of them each year, and used his knowledge to judge the innumerable disputes brought before him. Not that his word was Law in all instances; there was plenty of bloodshed at the Þingvellir as well. But generally Icelanders, having early decided they would have no king (they escaped Norway to get away from one) and wishing have the Law above all men, were successful in creating an early republic. 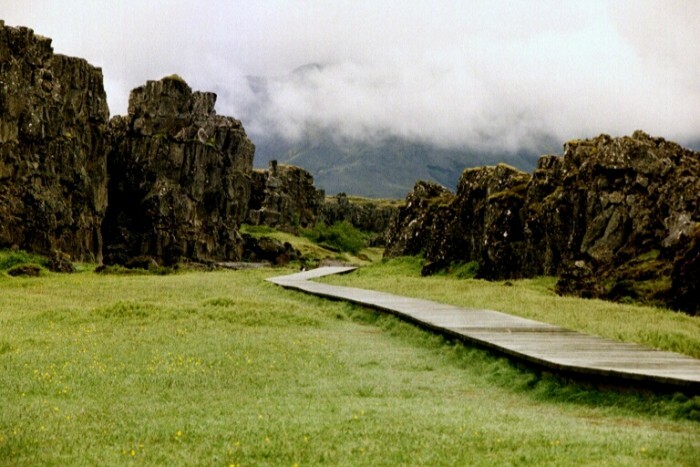 It was at Þingvellir in the year 999 or 1000 that the Law Speaker Þorgeir Ljósvetningagoði decreed, after arising from a trance state, that Iceland should accept Christianity and forsake the Old Gods. (It must be understood that this was a decision not made without duress. The King of Norway, Olafr Tryggvason, a violently zealous convert, was threatening to murder or mutilate a large number of young Icelandic men held as hostages in Norway if the country refused to convert.) The decision to accept Christianity was made by Þorgeir and accepted by the massed attendants. Two exceptions to the general Christian rule were allowed, however: Icelanders could continue to eat horsemeat, and continue to practice infant exposure. Both of these practices can be traced to the hardships of survival, and the eating of horsemeat might also relate to the worship of the mighty fertility God Freyr who had many ardent followers in Iceland and who was closely associated with horses. Þingvellir. This site apart from its intrinsic historic interest is also astonishing geographically, as it sits directly upon the rift caused by the tectonic plates of the North American and European/Asian continents. 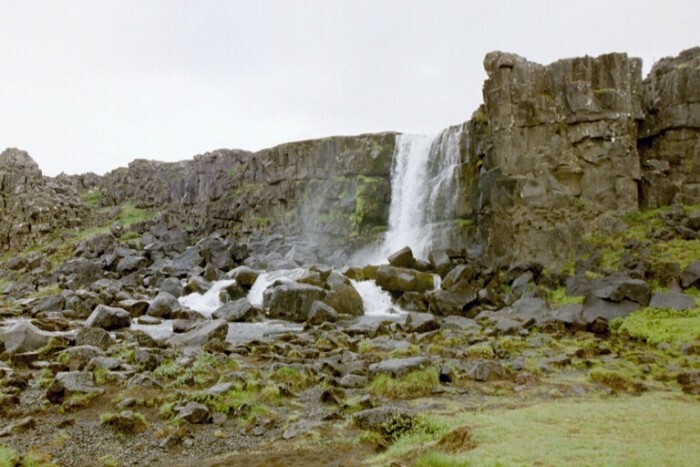 It is dramatic in the extreme, with towering crags, waterfalls, and near perfect acoustics. And one walks on a wooden boardwalk in a literal “no man’s land” between the two continents. 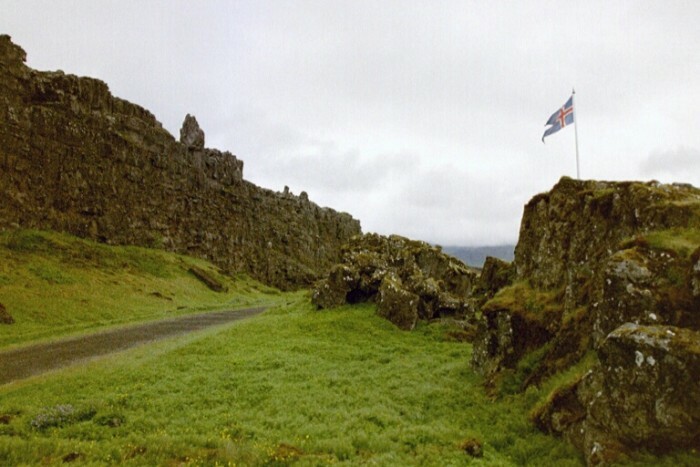 The Icelandic flag marks the approximate location of the Lögberg, “Law Rock” where the Law Speaker stood to address the assembled throngs. All free men were welcome to listen or to make comments, but only the 36 (later increased to 39) goðar, chieftains, could vote. 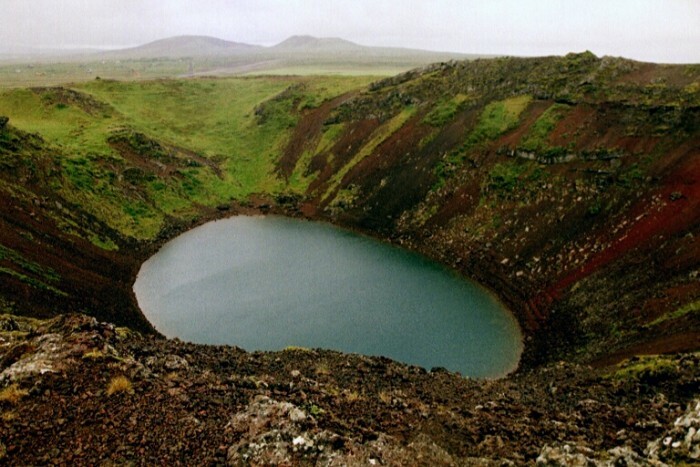 Finally, heading southeast on Rte 35, two views of the extinct Kerið volcano crater. The rainwater within the caldera is the same vivid ice blue as is found in many Icelandic rivers and streams. 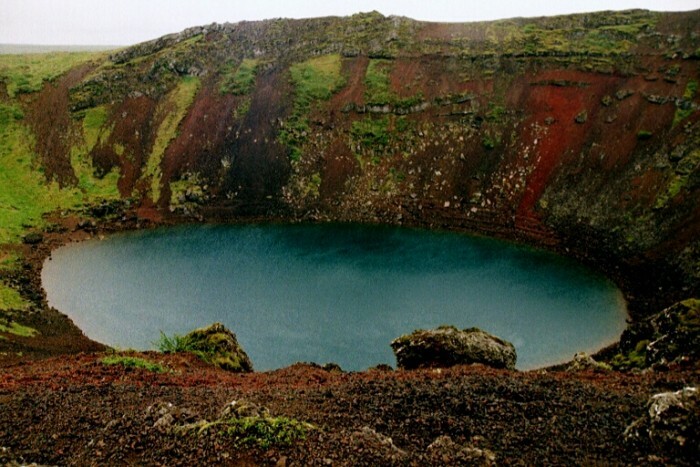 The singer Björk once staged a concert from a raft in the middle of the crater lake.